August 29, 2017 - A wildebeest's bad day got slightly better when two unlikely rescuers freed it from the jaws of a crocodile in Kruger National Park, South Africa. 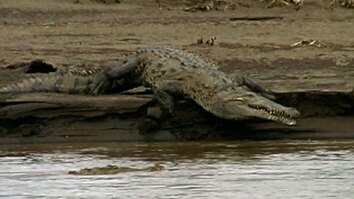 The croc grabbed the wildebeest by its rear hoof, and tried to drag it into the water for close to eight minutes. Just when it seemed that the wildebeest had no energy left to resist, two hippos charged in, causing the croc to let go of its prey. Hippos are territorial, and most likely weren't trying to intentionally save the wildebeest. The wildebeest hobbled away with what appears to be a broken leg. Click here to read Hippos Save a Wildebeest From Crocodile’s Jaws. A wildebeest's bad day got slightly better when two unlikely rescuers freed it from the jaws of a crocodile. 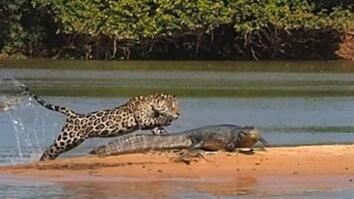 The croc grabbed the wildebeest by its rear hoof, and tried to drag it into the water for close to eight minutes. 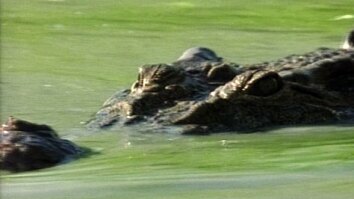 two hippos charged in, causing the croc to let go of its prey. Hippos are territorial, and most likely weren't trying to intentionally save the wildebeest. The wildebeest hobbled away with what appears to be a broken leg.